Find Out More Facts & Info From Various Web Sites That Provide Great Info About Your Favorite Cat(s) If You`d Like A Site Removed Or Added Please E-Mail Me Below. If Adding Your Site To The List Please Add Info Telling Other`s What They Can Find On Your Site. *Thank`s* =^..^= Happy Prowling! Find out more below about the big cats: Lions, Tigers, Cheetahs, Leopards, and Jaguars an Cougar`s think they should fall in the Big Cat range too. EndangeredTV is a site where you can view endangered animals with just information about the animals, and some facts about their impending extinction. Toping the list are Cheetahs, Sumatran and Siberian Tigers. This includes video clips of the animals as well. A great overview site to introduce you to all of the 5 big cats and the small wild cats too, where they live in the wild, brief info on their diet, habitat and etc. The organization of this site is very thorough. A great site for detailed info about the smaller wild cats as well as links to check out, posters you can order of the big cats (tigers, lions, cheetahs, leopards, jaguars) as well as information on current projects going on helping to protect these animals from extinction. Fantastic and interactive travel to discover the Jaguar. Great graphics and useful information. The Small Cat Conservation Alliance (SCCA) was founded in 1996 to address the conservation needs of small wild cats worldwide. The conservation needs of many small wild cats remain a mystery. SCCA is an alliance because many partners are needed to address these conservation issues worldwide. There is not enough time for a single individual to investigate all species of small wild cats.The mission of Small Cat Conservation Alliance is to ensure the survival of small wild cats and their natural habitats worldwide. Facts about the Cheetah gathered by Andrew Garman at Big Cats Online. A cool site featuring the Cheetah, his appearance, speed, social status, food likes, sounds, and two other species of Cheetah, lesser known than the African Cheetah. Contains general and precise information about the cheetah and its conservation, as well as an adoption programe. Very informative site discussing the plight of tigers in the wild, the problems, possible solutions, and gives you infomation about saving the tigers. An excellent site full of information about Tigers. Learn about the different subspecies, read news articles, conservation info. And information for teachers and students is also available. Tiger Touch offers new hope for endangered cats through sanctuary, research and education.Dedicated to the search for alternatives in the struggle to preserve endangered animals. Tigerhomes.org has one main goal and that is creating awareness of the near extinction that these and many other species face.Also has a large amount of Web Cams. Desktop Wallapaper icons for aim an much more. Is a unique wild tiger conservation partnership between the Zoological Society of London and Global Tiger Patrol. The Malayan Tiger was only considered a separate sub-species in 2004, making it the newest and ninth tiger sub-species. Like tigers around the world, the future of the Malayan Tiger is bleak. With less than 600 tigers left in the wild, tiger numbers will continue to decline due to loss of habitat and poaching. Malaysia has its own unique sub-species of tiger � the Malayan tiger Panthera tigris jacksoni, named after renowned tiger conservationist Peter Jackson, in honour of his years of work for tigers. Michael J Vickers is a wildlife conservationist and photographer who has a particular passion for tigers and travels regularly to India to search and photograph them in their natural environment. Some of Michael's photographs have appeared in The BBC Wildlife Magazine and in literature produced by The Born Free Foundation, Care for the Wild International, The David Shepherd Wildlife Foundation and The Environmental Investigation Agency. You will see above a small selection of Michael�s photographs taken at Bandhavgarh and Ranthambhore Tiger Reserves' in India. (Place curser over image for enlargement) The gallery portfolio also depicts wildlife pictures taken on Michael�s visits to Africa. The mission of The Cougar Fund is to protect the cougar throughout the Americas. The Cougar Fund educates the public on the value of cougars in nature and promotes the gathering and application of sound science in their management. By advocating thriving populations of cougars, The Cougar Fund ensures that these beautiful, legendary creatures�known for their grace, independence and incorruptibly wild nature�may exist in ways that enjoy long-lasting public support. Florida Panther Net where you can learn about our state animal, the elusive endangered Florida panther. At your fingertips is a rich store of knowledge about the panther, its habitat and the fascinating plants and animals that share its southwest Florida home. Panther Net is a project of the Florida Fish and Wildlife Conservation Commission's Advisory Council on Environmental Education. Panther Net is brought to you through proceeds from the Florida panther license plate. The Mountain Lion Foundation is a nonprofit conservation and education organization dedicated to protecting the mountain lion and their wild habitat to ensure that our wildlife heritage endures for future generations. The Cougar Network is a nonprofit research organization dedicated to studying cougar-habitat relationships and the role of cougars in ecosystems.We strive to conduct research on cougars and other wild cats in North America, maintain a reliable repository of information regarding large cat distribution and cougar range expansion, and promote working relationships with universities, conservation agencies, state and federal agencies, and the general public. Montgomery County, Pennsylvania (near Philadelphia) is home to beautiful Elmwood Park Zoo. Our mission is to "positively impact conservation by inspiring people to protect wildlife and their habitats". Located in central Norristown. The Buffalo Zoological Gardens is the nations third oldest zoo. Located in 23.5 acres of beautiful Delaware Park, the Buffalo Zoo exhibits a diverse collection of wild and exotic animals, and more than 320 different species of plants. Animals on exhibit include the lowland gorilla troop, rhinoceros, hyenas, polar bears,Lions,Servals, Golden Tabby Tiger and many more. Open year-round, the Zoo is a constant source of both education and entertainment for individuals and families throughout Western New York. Located in the beautiful country hills of upstate New York, Ashville Game Farm and Exotic Zoo is a fun place for children AND adults!! We have everything from monkeys and peacocks to tigers and leopards, bears, and more! 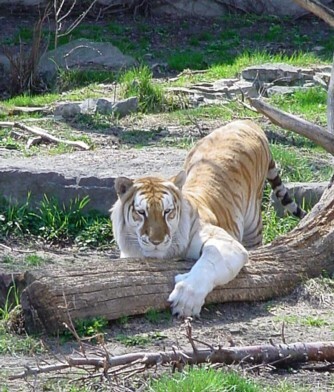 Our facility is large enough to house a wide variety of animals, yet small enough that it won't take you and your family the entire day to see and enjoy everything.Only White Tiger in NY state also a Golden Tabby Tiger a female as the Buffalo Zoo in NY has a male Tabby. Located In Halifax, PA Hundreds of animals reside along 50 acres of exhibits and displays at our wildlife park. These exhibits include African lions, American black bears, baboons, Bengal tigers, monkeys, ostriches, kangaroos, American alligators, pythons, tortoises, llamas, camels, alpacas, zebras, and more. The lions, bears, tigers, and baboons are housed in some of our most spacious, exciting, and recently renovated exhibits. The reptile and exotics building isn�t just home to snakes and lizards; it also houses many other animals such as critically-endangered tamarins, exotic marmosets, tropical birds, a sloth, lemurs, and a few surprises!The open-air Safari Tour transports visitors across 150 acres of rolling hills, pasture land, and wooded areas to witness many different animals moving freely. This excursion is a great opportunity for guests to see large animals up close. http://www.tdscats.com is a big cat refuge 2 1/2 hours away from Phialdelphia, PA. They also have a few other animals other then *Cats* too. ZOOAMERICA North American Wildlife Park displays an ongoing commitment to conservation. A key component in all of our educational offerings is to orient the participants towards an awareness of conservation issues. We actively support conservation efforts through financial commitments and donations to the Conservation Endowment Fund of the American Zoo and Aquarium Association. Through our support and commitment towards these organizations we can aid both worldwide and local conservation efforts undertaken by others. Direct involvement by ZOOAMERICA in many conservation programs continues to benefit species in Pennsylvania and other areas of North America. There are more then 200 residents at ZOOAMERICA,which offers Animal Encounters to allow a group to observe an animal up close and personal. Located in Hershey PA.
Come alive with nature and history. Explore the wild side of Space Farms Zoo and Museum. Space Farms offers educational fun for all ages. Where else can you step back in time and head for the wilderness all in one day? More than 100 beautiful acres of peaceful countryside offer plenty of room to picnic and play. As families roam the zoo and browse through the museums, an atmosphere of fun and adventure creates a memorable experience for everyone.Featuring more than 500 animals of 100 different species, Space Farms has the largest private collection of North American animals, in their natural surroundings in the United States. The zoo also has many exotic species from around the world. Space Farms is internationally famous for their bear and lion cub breeding programs. To establish a breeding program for Endangered Big Cat Species in areas where they will be protected from poaching. Allowing for an environment from where they can multiply in numbers sufficient to be released back in to their natural habitat. This program will be on-going until the Endangered Big Cat populations are diverse and sustainable enough to ensure their continued existence. We support tiger conservation, anti-poaching and education projects in Thailand, Russia and India and work with partner organizations to investigate wildlife crime. A website intended to provide information on carnivore ecology and conservation worldwide. The Cougar Rewilding Foundation is a 501(c)(3) non-profit, science-based, volunteer-run conservation organization dedicated to the recovery of cougars to all of their former range east of the Rocky Mountains. With a total population of 30-35 individuals, the Amur leopard, or Far Eastern leopard (Panthera pardus orientalis), is one of the most - if not the most - endangered large cats on earth. The ALTA Amur Leopard Conservation website provides information about the Amur leopard and about leopard conservation projects implemented by the Amur Leopard and Tiger Alliance (ALTA). ALTA has decided to dedicate this website to the Amur leopard because it receives, in general, much less attention than its famous cousin, the Amur tiger! Significant progress in conserving Amur tigers and leopards has been made over the last decade. A coalition of 13 international and Russian NGOs have pooled resources by creating ALTA (the Amur Leopard and Tiger Alliance). ALTA members have been co-operating for many years in developing, financing and implementating conservation projects in Russia and China. The Wildlife Conservation Society started by the Bronx Zoo in New York offers a great web site with information about wildlife including recently Jaguars as well as information about latest exhibits. The Congo Gorilla Forest exhibit online is a must to surf! Founder Annie Beckhelling, launched the project with a hectare of land provided by Spier Wine Estates located in Stellenbosch, South Africa. Cheetah Outreach then set out to introduce cheetah to the South African. Their website is a superb contribution. community. This foundation was conceived with the objective of saving tigers from imminent extinction by bringing together a network of people as well as corporate and government organizations that care about the survival of the few thousand tigers that still live on our planet. The Cheetah Conservation Fund (CCF) has been established to support wild cheetah conservation research and education. They are located in Namibia, Africa on an 18,000 acre farm called the International Cheetah Research and Education Center, CCF's US program is part of, and managed by, the International Wilderness Leadership (WILD) Foundation in Ojai, California, USA. A nice site to visit and learn a great deal about cheetahs. CAT was established in 1996 to organize and fund high priority conservation projects for the world�s 36 species of wild cat. CAT is a U.S.-based, IRS-certified 501(c)(3) nonprofit public charity directed by Kristin Nowell, the chief compiler of the Cat Action Plan and member of the Cat Specialist Group�s Steering Committee. Established in 1996 to organize and fund high priority conservation projects for the world’s 36 species of wild cat. A Sanctuary-Britannia environmental education programme in schools across India. Dutch organization dedicated to the survival of Siberian Tigers and Amur Leopards. Working to ensure the conservation of wildlife and wild lands of Africa. Due to the severe decrease in the numbers of these magnificent animals and their intertwined lives and habitats, APCRO is taking a pan-African, multi-species, holistic approach to their mutual conservation and research.APCRO, Inc. is determined to save these animals by examining the role of:disease,parasitism,genetics,nutrition,reproductive potential,pathology,APCRO is striving to provide specific scientific information to the wildlife and conservation community to better understand the problems and thus, ultimately the solutions to best conserve these predators. This is only possible with the efforts of groups such as APCRO and your support. The Big Cats is dedicated to advancing the awareness of big cats. By increasing interest in big cats among children and adults we can bring to light the issues that threaten the survival of many of these amazing animals. Our hope is that once others begin to read, view and learn about how marvelous and magnificent these animals are, they will become involved with helping to preserve these animals for future generations. Mountain Lion Pictures, Information and Wallpaper. Explore is a multimedia organization that documents leaders around the world who have devoted their lives to extraordinary causes. Both educational and inspirational, explore creates a portal into the soul of humanity by championing the selfless acts of others.explore�s growing library consists of more than 250 original films and 30,000 photographs from around the world. We showcase our work at film festivals, on over 100 public broadcast and cable channels, and on numerous online destinations including explore.org, Snag Films, Hulu and TakePart. Electronic archive of photographs, moving images and sounds of endangered species and habitats. Includes animal trainers, animal acts, children's educational or party exotic animal demos, circuses, animal assisted therapy or forms of entertainment for both educational or non-educational purposes. We have over 100 animal actors who have appeared in Feature Films, Television Series, Commercials, Video's, Stills/Print ads, Live events, Parties, Displays and Parades. Our animal trainers are specialized professionals, qualified to discuss the details of your shoot, which will insure you a safe, smooth and successful performance from the animal(s) you are intereseted in. Each trainer cares for and trains their particular animals, from bottle feeding to adult hood. Babies are raised at home with the trainer and their family members, creating loving and fun animals to be around. Our attention to love and caring for each animal, sets us apart from others as can easily be seen on every shoot, party or live event.Take a little time to check out "just some " of the animals we have to offer. Brian J. McMillan, owner of Hollywood Animals, is a second-generation animal trainer from England. From the age of fifteen, he traveled throughout Europe and learned his art by apprenticing with international renowned animal trainers and behaviorists.He worked with every animal imaginable such as elephants, tigers, leopards, lion, bears, dogs, horses, camels, reptiles, hippopotamuses to name a few. In 1971, he was recruited by Africa USA, at that time was the largest animal company in the film and television industry. Two years later he was producing new animal shows for Six Flags. Randy Miller�s Predators In Action is an exciting company that specializes in stunt action training of exotic felines, lions, tigers, white tigers, leopards, cougars, wolves, black and grizzly bears, and all other types of animals.He also did stunt work on films such as Two Brothers,Gladiator,Disney's Jungle Book 2,Music Video for The Lion King an * Many other Televison,Music Videos,Commercials ect ect. Incorporated in 1975, Animal Actors is an animal theatrical agency that has been providing animals for film, television, and live productions for over 25 years.Our animal wrangles are well experienced in professional training as well as camera angles and important filming values.Currently we carry an inventory of over three hundred animals.If by chance that does not include what you are looking for our long standing close relationships with other trainers provides us with trustworthy contacts that allow us to get what you are looking for.Animal Actors International Inc. is licensed by, U.S. Fish and Wildlife, Threatened Species, U.S. Department of Agriculture, New Jersey Fish and Game, and New York State Department of Environmental Conservation. For over 75 years, the Reynolds family has been legendary among film professionals for specializing in training complicated and intricate animal sequences with all kinds of animals. Sled Reynolds, the owner of Gentle Jungle, was raised in the tradition of approaching animal training as a privilege as well as a challenge and an adventure. Sled�s father, Fess Reynolds, trained animals for the film and television industry dating back to the days of silent movies and cowboy westerns. In the early years, Fess entertained large crowds as a bull fighter and rodeo clown and performed live acts with chimpanzees, lions and giraffe. Many of the animals Fess trained frequently shared the Reynolds� home.As an expert Liberty trainer, Fess trained everything from bulls to zebras for Liberty shows. He continued his work in Hollywood training a wide variety of animals for such movies as Swiss Family Robinson, Ben-Hur, Monte Walsh, Texas Across the River, and the Greatest Story Ever Told. Fess also trained Roy Rodger�s horse Trigger and Gene Autry�s horse Champ along with other famous animals for the film and television industry.Today, Sled's wife, Tamara, his brother, Ridge, and his sons, Titus and Jordan, are part of the professional Gentle Jungle animal training team.